Critical Link has developed numerous products based on the OMAP-L138 from Texas Instruments using the MityDSP-L138(F) family of products. We have found one of the most useful interfaces for data acquisition on the OMAP-L138 device from Texas Instruments to be the uPP (Universal Parallel Port) interface. 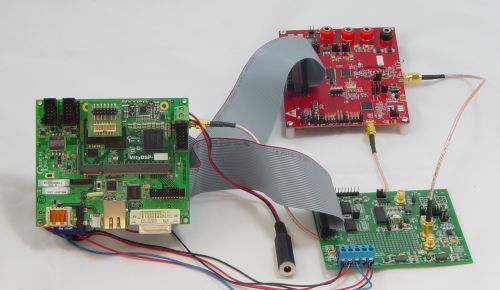 This interface is particularly well suited to data acquisition through the on-board Xilinx FPGA found on many of our modules, however, the interface is also quite versatile and useful for streaming data to or from a parallel ADC or DAC directly. 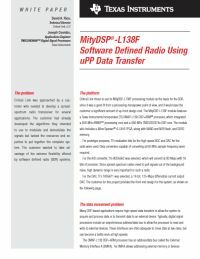 The white paper (linked at right) was developed in conjunction with Texas Instruments, and discusses in detail how we have used the uPP interface on a prototype system for a Software Defined Radio (SDR). Shown below is the system used in the development of the prototype SDR. In the photo is the MityDSP-L138F development kit. This kit was integrated with the EVMs from TI for the ADS5562 analog to digital data converter and the THS5671 digital to analog converter. The interface to the processor is provided through the Xilinx FPGA via the expansion headers on the rear of the MityDSP-L138F development kit base board. The ADC and DAC, both from Texas Instruments, were connected on the analog side via coaxial cable. The following resources and example source code are available to users who are using the uPP on the OMAPL138. The third bullet above provides the complete source code for a vision system based on the OMAP-L138 and the Xilinx Spartan 6 FPGA. This application is described in detail here. We provide the source code for our vision system as a complete example for how to interface the FPGA to to the uPP peripheral since we are unable to publish our customer’s SDR FPGA source code. Note that in order to download any of the files referenced above, users may be required to register for an account on the Critical Link support system.